Departments. Contact one of our talented sales professionals today. practical wheel diameter and anti-friction bearings if the application will permit. Using these tips, helps insures that you will maximize efficiency and productivity, and reduce work related injuries. Numerous factors need to be considered. the number of casters or wheels you will use; that will tell you the load capacity you will need for each caster or wheel. Be aware that the best combination of wheel, bearings, and caster frame requires more knowledge than just the load capacity rating. Our load capacity ratings are based on a speed of up to 2.5 mph intermittent usage over smooth floors in ideal operating conditions. Your application is seldom ideal. Did you know that heat generated from a heavy load being moved at a higher speed can cause the bonding agent which holds the tire on the wheel center to break down? The result can be tire separation and wheel failure. In order to determine the proper wheel for your application, you need to consider the type and condition of the floors they will be rolling on. Wheels with soft non-marking rubber treads (tires) provide the best floor protection on hardwood floors, such as in your home or in a school gymnasium. Wheels with Polyurethane treads provide floor protection when soft rubber wheels lack the needed capacity. There are also countless applications where only a hard non- metal or metal wheel will do the job. Remember that repetitive travel over the same path with wheels having a hard surface will eventually wear the surface of even concrete floors. Each of our wheels have numerous applications for which they are best suited. Other factors to consider when selecting a caster or wheel are: is abuse, impact or shock loads likely; is noise a factor; what speed will it be rolling; will the equipment be moved manually or by mechanically powered equipment; will they be used in temperature extremes hot/cold; will they come in contact with water, chemicals, oil/grease; will they be rolling over debris, cords, floor joints, etc; what is the condition and types of the floor surfaces (smooth, rough, uneven, broken concrete, coated concrete, asphalt, gravel, grass, carpet, hard- wood, linoleum, tile, etc). Each wheel type can be used in many different applications, and there are countless applications. 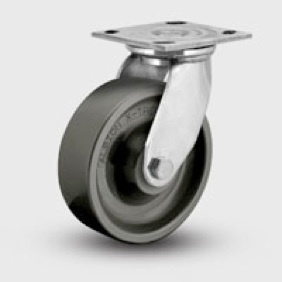 We urge you to read the pages describing each of our wheels and casters. If you still have questions or wish to confirm your choice, please Contact our Sales Department. We offer a broad selection of wheels capable of withstanding a wide range of temperatures from -50° F, to 1,300° F.
Please be aware that standard bearing grease will begin to harden at 20° F preventing bearings from optimum functionality. Both high temperature and low temperature grease is available, please inquire. Initial cost is an important factor in a purchase decision; however the fact is that choosing the least expensive casters that meet your requirements can save money up front; but may actually cost you more in the long term; including the cost for maintenance, down time, and replacement. Selecting stronger casters with a higher weight capacity, larger wheels, and better bearings insures maximum productivity and longer caster life.